Opened in 1993, The Garage quickly established itself as the capital's finest indie and rock venue playing host to many bands early on in their careers. Playing a show at The Garage became something of a right of passage. The venue became part of MAMA Group plc's estate in August 2007 in the acquisition of Mean Fiddler Holdings (which also included the Jazz Cafe and Borderline). In January 2009 MAMA Group and HMV created a new joint venture Mean Fiddler Group under which HMV acquired 50% ownership of 11 of MAMA Group's venues, namely The Garage, Jazz Cafe, Heaven, G-A-Y Bar, G-A-Y Late, The Borderline, Aberdeen's Moshulu and the renamed: HMV Hammersmith Apollo, HMV Forum, HMV Picture House, Edinburgh and opening later this year the HMV Institute, Birmingham... The Garage was refurbished in time for it's relaunch as the Relentless Garage in June 2009, with joint naming rights with Relentless Energy Drinks. The refurbishment featured major improvements including new dressing rooms and production facilities as well as new PA & Lights. It now has an increased capacity from 350 to 600. The venue has also become fully digitally equipped, so that bands can produce top quality live recordings for on the spot release. Venue Rules - Current England & Wales Licensing laws are strictly enforced - Ticket holder may be subject to search - Tickets are non-refundable or transferable - Venue requests no bags allowed into the venue - The venue reserves the right to change the bill without prior notification. - Ticket holders consent to any filming and sound recordings as members of the audience - Ticket holders may be subject to continuous sound levels which may cause potential damage to hearing - Ticket holders may be exposed to strobe lights - Only official merchandise is on sale inside the venue, do not buy outside. This is for your protection so that you will receive goods of proven quality. - No 'professional' type cameras, video cameras or sound recording equipment will be allowed in the venue. - Venue advises that tickets are non-refundable and non-transferable. - Venue advises only customers in possession of a valid ticket will be admitted into the venue. Lost, stolen or misplaced tickets will not be replaced. - No re-admission policy is strictly enforced - No bottles, cans, alcohol or food is to be brought into the venue - No illegal substances may be brought into or taken on the premises. Any one caught in possession of such substances will be ejected form the premises and may be reported to the Police - Any ticket holder throwing drink & objects (beer, glasses etc) will be removed from the building and no refund given. Furthermore, customer details will be provided to the regulatory authorities should an offence be alleged to have taken place. - The venue management accepts no responsibility for acts of willful endangerment, or injuries caused thereby to yourself or other patrons whilst on the premises. - No weapons. The management reserve the right to define & confiscate - No ticket monies, booking fees etc will be refunded following ejection or refused entry. - No smoking anywhere within the venue complex - at it's discretion the venue management will allow smokers out of the venue. Management reserves right to refuse admission PLEASE NOTE: Drinking on the street is prohibited in the Borough of Islington, any customer found in possession of alcohol will be refused entry to the venue and possibly detained for police action. This is a Challenge 21 venue. If you are lucky enough to look under 21 you will be asked to prove that you are over 18 when you buy alcohol. If you are under 18 you are committing an offence if you attempt to buy alcohol. The Venue adopts a neighbour friendly policy so please make as little noise as possible on leaving the venue. Highbury & Islington (Victoria line). The venue is a one minute walk from the tube. Highbury & Islington (Richmond to Stratford line). The venue is a one minute walk from the station. Go up Corsica Street, turn first left, left again and right (Pay & Display). Street parking is very limited . There is some parking space in the streets behind the venue around Highbury Flelds & the Leisure Centre. Though built in Victorian times, the building has been modernized to allow wheelchair access via front of house to the Ground floor level (please note there is no direct backstage disabled access). Due to licensing and Health and Safety Assessments, the number of wheelchairs that are admitted in to the building are limited. 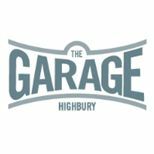 In order to ensure that all disabled patrons to the Garage are adequately catered for, we request that prior to booking, all disabled customers contact the venue (boxoffice@thegarage.co.uk, 020 7619 6727) in advance of ticket purchase to explain the nature of their disability.